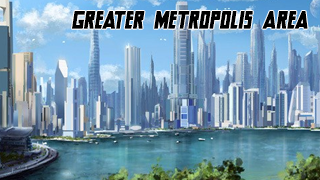 The Greater Metropolis Area is the capital city of the 5 Realms. It is the heart of the worlds government and houses everything a new comer and seasoned veteran hero can every want. Player homes are in the Residential Prefecture, Shops are in the Commercial Prefecture and the Seat of Ultimates is in the Hall of Ultimates. This area is where you go if you wish to set up a living space or a shop in which you work out of. You can have as many shops as you wish so long as they're all connected to one another and you keep up with them. All homes and shops must have (@Home) in the name. The location of all business and commerce. Stores can be found here. All player stores must have $Store in the title and be approved by the Approver.